Something I like about baking is that it forces me to slow down. I’ve had far too many mishaps — forgotten ingredients, missed or skipped steps — that have occurred simply because I was trying to move too fast. Unlike the short attention span required for most of what we do during the day, baking requires being thoughtful and thorough. It requires paying attention. In fact, when I bake, I usually try not to do anything else, like talk on the phone or read or even eat. I like to clear my schedule for the whole evening, or morning, or whatever it is, to focus on the recipe and nothing else. One of the biggest secrets of baking, maybe the biggest secret, is being able to follow instructions. It’s more than half the battle. People who say they “can’t bake” probably really just can’t follow instructions, or don’t have the patience to. I think the reality is that just about every one of us could be an excellent baker or cook if we take the time do it. True, recipes can be overwhelming. It’s a lot to take in, and a lot at stake. But as with anything, from riding a bike to playing an instrument to learning a language, if you stopped when it got hard or scary or overwhelming, you’d never get very far at all. Just as the payoff for those other things can be so great, the rewards of baking speak for themselves. Preheat oven to 350º F. Line baking sheet with parchment paper. Cut smaller strawberries in half, larger strawberries in quarter. Combine strawberries, honey, oil, balsamic vinegar and salt in a medium bowl. Gently mix until strawberries are evenly coated. Spread strawberries evenly onto the prepared sheet pan. Bake until juices just begin to thicken, 40-50 minutes. After cooled, gently pick up strawberries and place in a small bowl. Reserve juices in another small bowl. Use immediately or store in the fridge for up to one week. Combine flours, sugars, baking powder, and salt in a large bowl. Whisk for at least 30 seconds to thoroughly blend. Melt butter in a small saucepan and cook on medium-low heat until gently browned. In a medium bowl, whisk together oil, browned butter, sour cream, egg, and vanilla extract. Whisk until well combined. Make a well in the center of the dry ingredients. Pour oil mixture into the well and stir until just combined. In a medium bowl, whip heavy cream to soft peaks. Fold whipped cream into batter. Using two large soup spoons or an ice cream scoop, fill the nine prepared muffin cups half way with batter. Lay 2-3 roasted strawberries over the batter. Fill muffin cups nearly to the top. 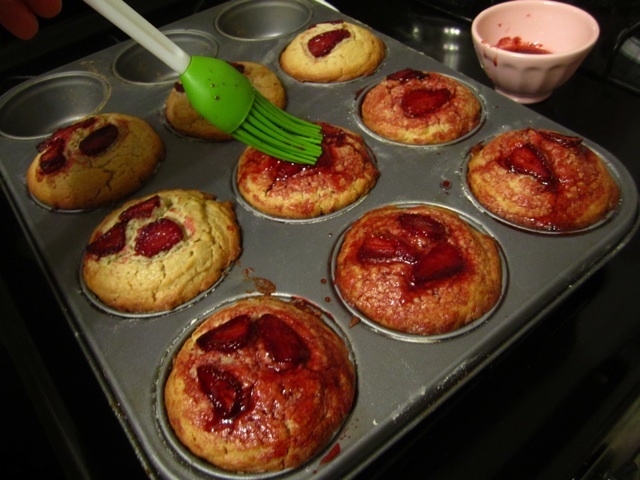 Lay 2-3 slices of roasted strawberries on top of muffins. Gently press into batter. Reduce oven temperature to 400º F. Open door and leave open for 10 seconds then place muffin tin on baking stone or lower third shelf. Bake for 20-25 minutes, or until a toothpick comes out clean when inserting into middle of muffins. Poke several holes in tops of each muffin with a toothpick. 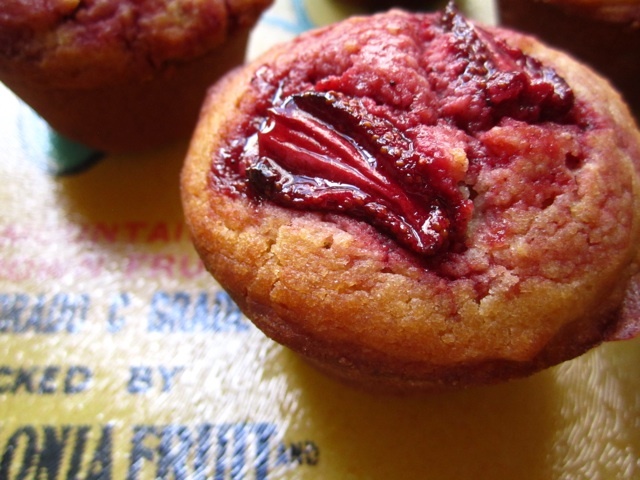 Brush muffins with reserved roasted strawberry juices. Gently loosen top edges of muffins and twist each muffin out. Lay them on their side in the muffin cups to cool. Reserve any unused roasted strawberries for a delicious addition to oatmeal, yogurt, pancakes, or ice cream. 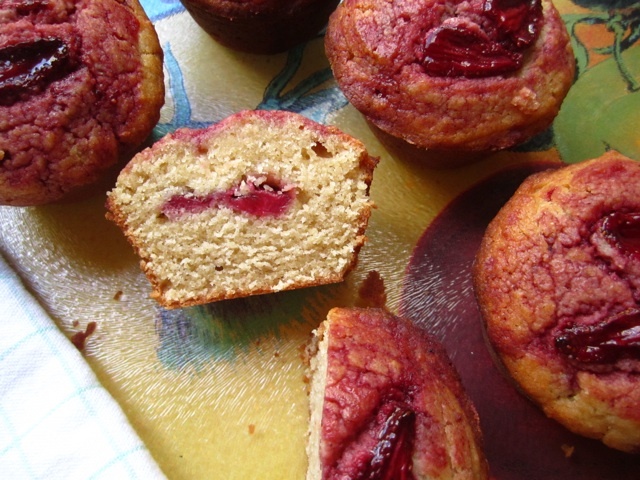 This entry was posted in Not pie and tagged muffins, strawberry, whole wheat. Bookmark the permalink. These look delicious, and with the strawberries plentiful this time of year, I will make these for breakfast and lunch, and dinner!